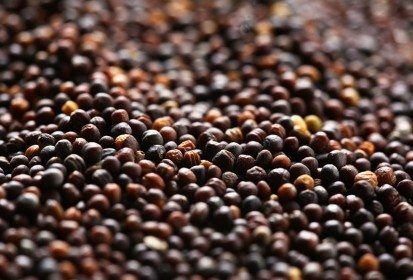 CNS Canada – Canola futures slid to their lowest levels in 15 months during the week ended Nov. 9, but managed to uncover some support to the downside and could be consolidating. While off-the combine deliveries were slowing down with the advent of winter, the commercial pipeline is still filled with recently harvested canola supplies. The weekly Canadian Grain Commission numbers showed that weekly farmer deliveries declined to 378,800 tonnes during the first week of November, from about 500,000 the previous week. However, with exports also down on the week, total visible supplies of 1.494 million tonnes are more than enough to meet the nearby demand and should be limiting end-user buying interest. From a chart standpoint, the January contract traded below the psychological C$480 per tonne mark during the week, with prices hitting their weakest levels since August 2017. However, values were hard pressed to go much below that, with speculative short covering coming forward on any attempts at breaking lower. However, most analysts remain of the opinion that it’s only a matter of time before the support fades, with a downside target of C$450 a distinct possibility over the next few months. Activity in Chicago Board of Trade soybeans will have a big influence on what happens in the canola market as well, with the United States harvest wrapping up and attention turning to the South American growing season. The U.S. Department of Agriculture released updated supply/demand estimates on Nov. 8 which included a sharp decline in projected soybean exports and a resulting increase in the U.S. soybean ending stocks forecast. While there have been occasional tweet-fueled rumblings of a possible resolution to the China/U.S. trade dispute, nothing tangible has happened yet and exports could decline further in subsequent reports. A meeting between U.S. President Donald Trump and Chinese President Xi Jinping at the G20 conference in Argentina at the end of November will be followed closely. Mounting concerns over African swine fever in China could also come to play in the soy market, as any reductions in China’s large hog herd would cut into the global demand for soymeal. Soybean futures posted some large price moves during the week, but were trending lower overall. Corn was also choppy during the week, with seasonal harvest pressure keeping the overall bias pointed lower despite a downward revision to the U.S. yield estimate from the USDA. For wheat, ample world supplies and continued export competition out of the Black Sea region kept North American prices under pressure. However, winter wheat seeding delays in parts of the U.S. Plains were being followed as a potential supportive influence, with some intended acres likely ending up unseeded before the winter sets in.